Woods of Tillicoultry has taken delivery of a Mercedes-Benz Sprinter 516CDi based Unvi Vega GT. The vehicle’s bespoke specification includes eight Politecnica Trans Europe Express leather seats (but it can be up-seated to 12 if required), a Diavia air conditioning system, a fridge and a Bosch entertainment package. 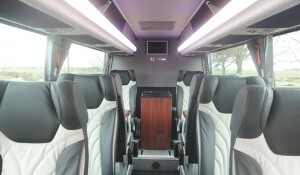 The minicoach was supplied by Coachtraders.